There are numerous health benefits of coconut oil including digestion problems, manage type 2 diabetes, stress relief, maintaining cholesterol levels, weight loss, increased immunity and boosts metabolism just to name a few. 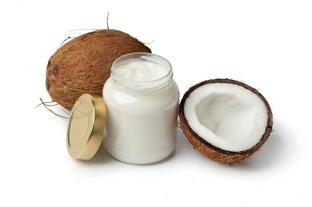 Coconut oil also has many benefits for your beauty regime? Solve 11 of your beauty problems naturally with a $11.00 jar of Coconut Oil. This won’t work for dry digits when you’re on the go, but at home, coconut oil can work wonders on your dishpan hands. Try keeping a jar of organic extra virgin coconut oil by the kitchen sink and put a little on after washing your hands to keep them soft and moist. If you cook with coconut oil (you can substitute it for butter in baking recipes because it’s solid at room temperature) scoop out a little extra for your hands. Coconut oil isn’t just for cooking, it makes the perfect moisturiser for your hands and body. Nothing perks up a tired face like a little highlighter, but you don’t need store-bought products to achieve the same effect. Simply sweep a tiny amount of coconut oil on top of makeup and leave it alone. It looks like your skin but glowier, which is why many natural makeup brands use it as a base ingredient in their formulas. If you’re looking for a more portable option, try the cult favorite Living Luminizer by RMS Beauty, which has a coconut-oil base and light reflecting pigment. Conventional shaving cream is an expensive cocktail of chemicals that you don’t need to get a nice clean shave on your legs or underarms. Coconutoil, on the other hand, is inexpensive, naturally antimicrobial, and smells divine. Plus, its skin-soothing properties will leave your legs looking hydrated (but never greasy). There’s a reason many conditioners contain coconut oil: it’s better able to penetrate hair (and prevent protein loss) than mineral and sunflower oil, according to research. You can use it on your hair and on your skin for deep conditioning. Apply a twenty cent size dollop to your hair, comb it, and then pile it into a loose bun. You’ll want to place a soft towel over your pillow or sleep in a shower cap. In the morning, shampoo as usual. Yes ladies, coconut oil even works on waterproof mascara! Put a little on a cotton ball and gently sweep it over your eyes, paying attention to your under-eyes as well. The oil does a great job breaking down waxy, inky eye makeup, and leaves the delicate area hydrated, too. Once you’re done, wash your face as normal. A recent animal study found that when applied topically, virgin coconut oil can speed up wound healing, and a human study found it to be effective in increasing hydration and reducing water loss in seriously dry skin. Sounds like a recipe for a really good lotion! It’s a health-expert favourite, too. It smells delicious, is very affordable, and leaves skin feeling nourished and smooth. Because coconut oil is naturally antibacterial, antifungal, moisturising and, according to research, great for atopic dermatitis, many women swear by its use as a night time moisturizer for their face, too. Smooth a tiny amount of coconut oil onto your ends to add a little shine, or on flyaways if you have dark hair. Remember that a dab will do you: anymore and your hair might appear greasy. Here’s a little D.I.Y beauty secret: That store-bought body scrub you save for special occasions? It’s a waste of money. That’s because you can make one yourself with ingredients you already have in your kitchen. To make your own, melt 1/2 cup of coconut oil at very low heat. Pour it over 1 cup of brown sugar or salt and stir well. If you have some on hand, add in five drops of your favorite essential oil or some pure vanilla extract for a scrub so fragrant you’ll want to eat it. Many store-bought massage oils have either coconut or jojoba oil as their base. Cut out the middleman and go straight to the bottle. It’s slippery, skin-friendly, moisturizing and absorbs quickly. Coconut oil could be a healthy, non-chemical additive in toothpaste and mouthwash, Irish research suggests. Scientists have found that when the oil was treated with digestive enzymes it became a powerful killer of mouth bugs that can lead to dental cavities.